The plot line is straightforward. Nazareth Manoogian, a young blacksmith from Mardin in south Anatolia, is awakened one night in 1915 by gendarmes who whisk him and his brother-in-law away from their terror-stricken families, saying they must serve in the Ottoman army. Instead the men must work as slave laborers in chain gangs of work battalions. Those who refuse the offer to regain freedom by converting to Islam, are lined up for execution. The order “not to waste a bullet” means their throats are to be slit. Nazareth alone survives because, as his would-be executioner, an ex-convict released from prison to serve in the killer squads, tells him, “I am a thief, but not a murderer.” He receives a cut in the throat (whence the name of the film), but survives, albeit having lost the power of speech. The two join a group of deserters, then, after he learns that his family has been deported to Ras al-Ayn, he leaves in hopes of finding them. Thus begins the odyssey which makes up the rest of the saga. In a death camp in Ras al-Ayn he finds his sister-in-law, mortally ill, and bends to her plea for release from suffering by hastening her death. Having learned from her that his twin daughters, Lusine and Arsine, survived among Bedouins, he wanders on, finally reaching Aleppo with the help of an Arab soap manufacturer who smuggles him into the city and gives him shelter. In his search among the orphanages that had taken in Armenian children, Nazareth finally happens upon the one that had sheltered his girls and then arranged for their transfer to Cuba, where they were to find worthy husbands. He recognizes them in a photo hung on the wall, a photo which will guide his search. He works his way to Cuba aboard a ship and finds out in Havana that the marriages, arranged by the wife of a barber, never took place, because one prospective husband refused to wed Lusine, who had been lamed by a broken leg, and her twin sister Arsine preferred to stay with her. The two girls reportedly have moved on to Minneapolis, where they found employment as garment workers. Nazareth, sure to be refused entry to the US because of his disability, connects with a human trafficker and steals money to finance his boat journey. From Florida he makes his way, through Tampa and Tallahassee, to Minneapolis, with whatever means available: on foot, as a stowaway on trains, whatever. When he finds the garment factory, whose address he has, he learns that the girls have left for North Dakota. The trek continues, through wintry snow and ice-cold temperatures. At long last, in a remote village where many Armenians had found refuge, Ruso, he finds his daughter Lusine. Arsine has died, and his journey ends with their visit to her grave. One aspect of the beauty in Akin’s film stems from this truthfulness. As the massive historical research documents, it was the modus operandi of the Special Operations set up by the Young Turks to round up able-bodied Armenian males and either execute them immediately (often by firing squads in outlying fields) or enroll them in labor battalions until they died of exhaustion or converted to Islam. The women and children, along with the aged, were forced into death marches known euphemistically as deportations, and those who did not die along the way were left to perish in the concentration camps in the Syrian desert. Many of the children and young women survived thanks to the intercession of compassionate Turks, Arabs and Kurds who took them in. Those who were not Islamized, Turkified and married off, were released after the war to orphanages, where surviving relatives searched, like Nazareth, for any trace of them. Aleppo was a leading transit point and many made their way to America via Cuba. Down to the finest details, the account is accurate. This applies to the portrayal of psychological realities as well. Akin does not glorify his hero. A good Christian, Nazareth is however capable of brutally beating up the man who rejected his daughter and fleeing the scene of the crime. Then, on second thought, he returns to the man lying in an alleyway to rob him. This takes place following a Sunday church service which Nazareth attends as a favor to his host. Nazareth also gives in to the thirst for vengeance when he joins a mob throwing stones at a sad march of Turks withdrawing after the defeat — until he sees an innocent child bloodied by one stone and is struck but pangs of conscience. The devastating scenes of suffering and dying he witnesses have shattered his faith. All these psychological reactions have been documented in the Genocide literature, as reported by Rubina Peroomian, for example. Akin, born in 1973 in Hamburg, researched his subject scrupulously over years and benefited from the expert advice of Wolfgang Gust, a pioneer of Genocide research in Germany who collaborated with him closely on the project. Yet, the film is not a documentary. In a certain sense, that the Genocide occurred as it did is a “given” and the focus of the work is on the destiny of the individual human being (and not only the Armenians). By presenting the Genocide as a matter of fact not open to dispute, Akin implicitly deals the denialist camp a mortal blow. If his film is truthful in this poetical sense, it is not therefore less truthful, but more so. Nazareth’s story is the story of one discrete human being (regardless of whether anyone by that name existed or not), and it is at the same time emblematic of the experience of hundreds of thousands of survivors. As every Diaspora Armenian knows, their tales are all different, yet all alike. Nazareth’s saga thus assumes universality. The work is highly poetical in method. Instead of spelling out the historical facts or relating events in direct narrative form, Akin works through metaphorical association. Single images, captured visually by a cameraman endowed with an artist’s eye, portray entire chapters. For example, the scene of the camp where he finds his sister-in-law: There is no need to “explain” how these emaciated civilians ended up there, why some wander about crazed, or who erected the make-shift tents with scraps of cloth pitched on branches of scarce trees. Or, the scene where Nazareth finds a well and seeks to draw water to quench his thirst. Peering into the hole he sees naked bodies lying at the bottom of the well. The image appears and disappears in an instant. The contrast between the visual beauty of the scenes, as photographs, and the atrocities they depict enhances the tension of the drama. Akin uses metaphor to develop his themes, as in a musical composition or a dramatic poem. At the very beginning, for example, there is a scene of Nazareth picking up his young daughters from school. In response to remarks by the geography teacher, to the effect that they could do better in the subject, Nazareth puts the girls to a mock text. “What is the capital of France?” he asks. “Paris,” comes the right answer. But when he asks about the capital of America, one daughter guesses New York, the other, Chicago. They cannot imagine (nor can the viewer) what American place names will mean for them in the future. In another scene Nazareth is among a crowd of refugees in a shelter, viewing a film in which Charlie Chaplin is separated from his ittle girl then reunited with her — images that will be recalled at the end when Nazareth is reunited with his daughter. And music, on the opposite side of the sound spectrum, plays an integral role in maintaining thematic unity, from the deep, plaintive monotone strains accompanying the trek through the desert to the haunting, melancholic refrain sung by Nazareth’s wife and repeated in several variations thereafter. 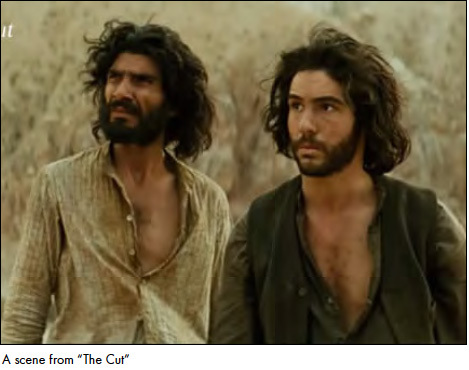 Akin utilizes images also to portray Nazareth’s struggle with religious belief in the face of such injustice, images that take on a cameo-like character: to avoid being recognized as an Armenian, he is advised to cover up the tattooed cross on his wrist and does so. When seized by despair, he seeks to rub out the cross with a stone, in a symbolic abandonment of faith. How will different audiences receive this film? For Diaspora Armenians, it is a painful experience, because it calls up the real personal recollections of those closest to us. However much or little we know of the individual suffering of our parents or grandparents, we automatically wonder what they actually did suffer, and never communicated. At the same time, the sensitivity, truthful rigor and profound artistic mastery – including fleeting moments of comic relief – displayed by Akin make “The Cut” a work of art, a tragedy but not without the element of the sublime. When Nazareth learns from Lusine that Arsine is dead, his pain is profound. “But,” she says, ‘‘father, you have found me.” Yes, the Genocide took place and 1.5 million Armenians lost their lives, but hundreds of thousands, perhaps a million survived, many of them thanks to the good person, whether Kurd, Turk or Arab, who acted out of human solidarity. Nazareth, his home lost, his family annihilated, his nation destroyed, nonetheless succeeds in his life’s mission and thus embodies the triumph of the human spirit. For Germans, as Wolfgang Gust has written, the film should stimulate interest in learning more about the Genocide and finally confronting and working through the role that wartime ally Germany played. He added that it will for sure reawaken the memories of many families who experienced deportations and suffering in World War II. And in the ongoing crises ravaging Syria and the region with their unprecedented refugee flows, the film acquires an even greater urgency. The impact in Germany on the Turkish community and in Turkey, when the film appears there, may contribute further to breaking through the wall of silence and denial that has been erected by Turkish officialdom. The fact that Akin refuses to fall into clichés and differentiates between the crimes of the regime and the humane actions of individual citizens opens the path towards understanding and ultimately reconciliation. For those Americans without any family connections to any of the communities involved, the film may serve to revive interest in the positive role the US government and people played after the war to aid Genocide survivors, especially orphans. At the same time, the callousness and ignorance displayed by certain layers of the population in the early 1920s, especially in backward regions in the South and mid-West, will serve as a reminder of the problematic aspects of popular culture. Whatever the audience, this film will make an impact. It is to be hoped that it will contribute to the discussion process unfolding in civil society layers in Turkey about the Genocide and related issues. Only when the film is shown in Turkish cinemas will relevant civil society groups be able to voice their evaluation.